HomeConditions & Symptoms FAQWhat is Celiac Disease? 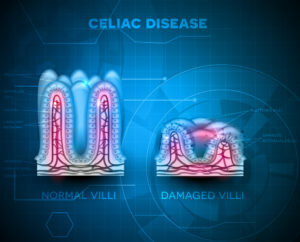 Celiac Disease is a hereditary condition which causes your body to have an adverse autoimmune response to gluten, a protein found in grains such as wheat, barley and rye. There is a 1 in 10 risk of developing celiac disease if you have a first-degree relative with the condition. If you suffer from celiac disease, then the ingestion of gluten will cause your body to produce antibodies that will damage the lining of your intestines, causing malabsorption issues and unpleasant symptoms. There is no standard treatment, as such, for celiac disease. Once you are diagnosed, you should avoid all foods that contain gluten, such as wheat, rye, barley, and oats. Once you have excluded gluten from your diet, you should see a rapid improvement and your intestine will usually recover within a few months. If you have suffered severe damage to your intestines and a gluten-free diet doesn’t resolve your symptoms, you may need medication to deal with the symptoms. Intravenous nutrition supplements may also be required if you have malabsorption issues.